The saurischian, or "lizard-hipped" dinosaurs, like all other tetrapods, had pelves (hips) composed of three elements: the ilium, ischium, and pubis. What distinguishes saurischians (among other major characteristics; including a grasping hand, asymmetrical fingers, and a long, mobile neck) is the pubis that points downward and forward at an angle to the ischium. The saurischians form two major groups. The Sauropoda were large herbivores such as Apatosaurus and Diplodocus. The Theropoda were bipedal carnivores (meat eaters), ranging from the chicken-sized Compsognathus and the fearsome Deinonychus and Velociraptor to the crested Dilophosaurus and the gigantic Tyrannosaurus. 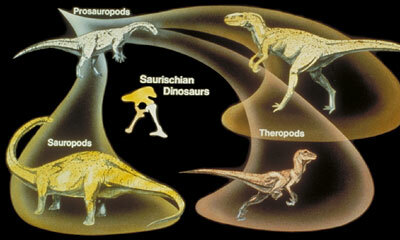 The oldest known dinosaurs, from the middle Triassic of South America, were saurischians. Living birds had common ancestors on the theropod lineage. Oddly, birds are derived from the "lizard-hipped" dinosaurs and not from the "bird-hipped" ornithischian dinosaurs. The "bird-hipped" condition of a pubis pointing toward the back of the animal occured twice independently, once in the ornithischians and once in the lineage leading to birds, an example of convergent evolution. Thus "ornithischia," taken literally, is a misnomer, since the ornithischians have ornithischian-like pelves, not bird-like. Only birds (and their immediate ancestors) have bird-like pelves.